Of Course Michael Jordan Says He’s the Best. Why Wouldn’t He? Now, any self-respecting Clevelander is probably not going to really ever get over The Shot, but then again, we wouldn’t be alone. Jordan had a habit of dashing fans’ hopes all over the place. Just ask Utah. And still, even years after retirement, despite the pain, he is still revered for his greatness. Need proof? How many of you are waiting in line for the next line of his sneakers? And he hasn’t played an organized game in more than a decade. 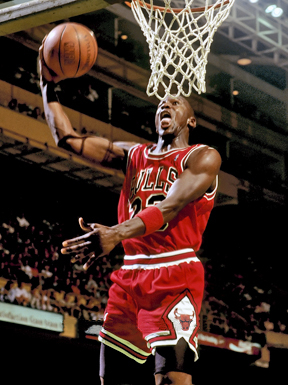 Even in retirement, and aside from the fact that his ownership and management of the Charlotte Bobcats has be a trainwreck, Jordan still has the swagger of a champion. And as a player, you can’t really touch it. Who could when you have six rings? Whatever you think of the playing ability of any other player that has come since Jordan, His Airness has an X-factor none of them has. He transcended sports to a higher level than any of them. And even if you couldn’t stand the guy, you always knew that the Chicago Bulls were his team and nobody else’s at all times. It’s that trait that’s lost on the players today, especially in an era where they treat NBA teams like the AAU squads of their youth. Jordan may sound surly when he says it, but really, there is no way he would have banded together with Charles Barkley or David Robinson. He made it abundantly clear. He didn’t want to play with the best. He want to play against the best. So, the next time you hear someone interviewing Michael Jordan, whether it’s today, tomorrow or five years from now, expect him to say he’s the best. And you can’t really dispute it. This entry was posted in Basketball and tagged Michael Jordan on October 1, 2013 by Bob McDonald.